"The International Development Placement Association is rendering a significant service in our foreign relations. We of the West have too long and too often gone to the East with a domineering, ruthless, and exploitive attitude. If we are to become partners with the Asians in the works of peace, we must learn to go to Asia with humility and understanding. The International Development Placement Association is one of the agencies that meets this high standard. The men and women whom it sends to Asia will work in the villages, helping people there to help themselves. These emissaries will do more to build understanding between these two worlds than all the wealth and all the military might America can muster." -- Supreme Court Justice William O. Douglas, Washington, D.C., December 6, 1951. Here is the story, including the connecting links to the Peace Corps. During my senior year at Berea College, while serving as national chair of Students for Democratic Action (the student division of Hubert Humphrey's Americans for Democratic Action) I corresponded with University of Michigan graduate George Shepherd, then studying for a doctorate at the London School of Economics, and with students Julius Kiano (from Kenya) and Nelson Jonnes (sic) at Antioch College, Ohio. The four of us, and Berea classmate Galen Martin, agreed there ought to be a program that would place people in modestly-paid jobs with indigenous organizations and governments in Africa, Asia, and Latin America. The people placed, we proposed, would be idealists with zeal for humanitarian service but without the ethnocentric holier-than-thou attitudes which for decades had characterized all too many Americans and Europeans in their contacts with the darker-skinned two-thirds of humanity. We had had experiences in Quaker-sponsored voluntary workcamps where students contributed their labor to inner city community improvement projects, but now we were thinking of entry-level jobs for teachers, nurses, agricultural extension and community development workers, and cooperative organizers -- people who would live and work closely with their host country co-workers. My exploratory efforts began with a June 12, 1951 three-page mimeographed letter sent from my home address in Lansing, Michigan, to some 65 youth and student leaders in many states. The letter focused on the need for skilled, motivated people to work in Africa, but in a few weeks we were including Asia and Latin America as well. While I pondered a choice between a post-B.A. year at Oxford (where I'd been accepted by Ruskin College, a British trade union institution), and a tentative offer of a very challenging job managing an African farmers' marketing cooperative in Uganda, my draft board informed me that since I hadn't yet served Uncle Sam, I couldn't pick either of those options -- I was told not to leave the country. So the Fall of 1951 found me living at Pendle Hill, a Quaker adult education center in Wallingford, outside Philadelphia. It became my congenial three-month home base while I proposed -- and sought board members, endorsements, and funding for -- a new organization. After first using the name International Development Association, we concluded it should be called the International Development Placement Association. It would be a non-profit agency, to recruit highly motivated applicants with entry-level skills needed in widely assorted jobs with indigenous organizations and governments in developing nations. I.D.P.A. would recommend carefully selected applicants to those institutions and government agencies. Accustomed to the tight budgets of non-profit organizations, we did not anticipate being able to have I.D.P.A. itself employ, transport or pay medical or other expenses of the recruits -- as Peace Corps would later do. As potential I.D.P.A. board members I sought primarily experienced leaders of U.S. youth and student organizations; several of us had been involved in the 1947 formation (at a national convention in Madison, Wisconsin) of the National Student Association, whose first president, Bill Welch, was from Berea College. Two highly important recruits for the I.D.P.A. leadership were Harris Wofford (the first president of Student World Federalists, in later years a J.F.K. staff member and Peace Corps Associate Director; college and university president; U.S. Senator from Pennsylvania; and in the 1990's, C.E.O. of the Corporation for National Service) and Frank Wallick (my predecessor as chairman of the student division of A.D.A. ; in later years editor of the United Auto Workers' very effective Washington newsletter). Harris Wofford landed urgently needed foundation grants (from Stringfellow Barr's Foundation for World Government), to get us started. Frank Wallick was soon an assistant to Congressman Henry Reuss (D., Wisconsin), who was to play a crucial role in the procession toward the 1961 triumph of the idea. 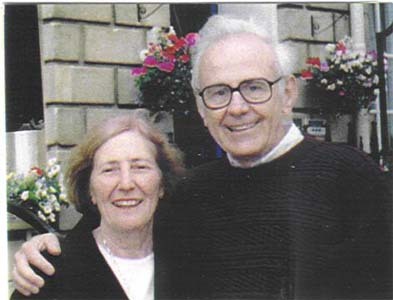 I felt Frank Wallick's two-year experience as a Brethren Service Committee volunteer working at subsistence pay in pre-Communist China would be valuable, on the IDPA board; most of us then had very limited overseas experience. In an effort to gain widespread support for the I.D.P.A. concept, I sought and to my great satisfaction received ringing endorsements from Supreme Court Justice William O. Douglas, T.V.A. 's former Chairman David Lilienthal, and International League for the Rights of Man (and A.C.L.U.) founder Roger Baldwin. I thought of myself as an organizer, not a potential I.D.P.A. administrator, and had decided to begin graduate study of economic development planning in January, 1952 at the University of Chicago (in the Planning Program headed by Rex Tugwell and Harvey Perloff). Thus I was pleased that Barrington Dunbar, who had been a UN Children's Fund representative in Haiti, was available to serve as IDPA's first Executive Secretary. After I left for Chicago, Clifford Dancer was elected board chair at a December '51 I.D.P.A. board meeting, and Peter Weiss was soon chosen as I.D.P.A. 's Executive Director, based in a new office in N.Y., which then moved to the Carnegie Endowment International Center, two blocks from the United Nations. I.D.P.A. seemed to be on its way; my only remaining role was to serve in 1953 as an I.D.P.A. advance "scout" in Gandhi's chosen central India village, Sevagram, after a hitchhiking-to-India adventure. Harris and Clare Wofford's book INDIA AFIRE had inspired my interest in Sevagram, where Gandhi and his Nai Talimi Sangh (New Education Organization) had established a training center for teachers and rural development workers. By the time I.D.P.A. began folding, in 1954, for lack of major financial support, office files held applications from 502 potential volunteers. (I.D.P.A. had lost its tax exempt status due to the failure of two I.R.S. staff members to understand and appreciate its "placement" function.) Eighteen pioneering men and women, most of them under 30, had been placed in a wide variety of teaching and social service positions in India, Nigeria, Indonesia, Uganda, and elsewhere. Government agencies, non-profit organizations and universities in several additional countries were requesting applicants. In his 1980 book OF KENNEDYS AND KINGS: MAKING SENSE OF THE SIXTIES Harris Wofford noted that "I.D.P.A. proved that the assignments were waiting and young Americans were ready, but that placement and recruiting was unduly costly when done on a small scale" (p. 253). But as the reader knows, that was not the end of the story. In 1955 I.D.P.A. board member Frank Wallick and his wife Ruth joined the staff of Congressman Henry Reuss (D., Milwaukee). 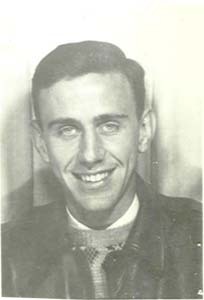 Frank Wallick encouraged Reuss' interest in international volunteerism, and assisted in promoting the "Point Four Youth Corps" bill which Reuss introduced in the U.S. House of Representatives. Reuss, and Senator Hubert Humphrey, with his U.S. Senate "Peace Corps" bill -- using that name for the first time -- proposed that resources of the federal government should make possible what major foundations had been unwilling to risk doing. In the 1960 Wisconsin and West Virginia Democratic presidential primary campaigns Hubert H. Humphrey advocated establishment of a Peace Corps. In his 1976 book THE EDUCATION OF A PUBLIC MAN, Humphrey recounted how, after losing the crucial West Virginia primary to the Kennedy forces, "since I was not to get the presidential nomination, I was determined that Kennedy adopt as many of my proposals as possible." Humphrey "set out to influence his decisions, particularly in the areas in which I could make my greatest contributions: agricultural policies, civil rights, economic development, arms control, and the Peace Corps" (p. 229). Kennedy staff members also recommended the idea to the nominee. After Kennedy briefly spoke of the possibility -- never using the words Peace Corps -- in a huge rally on the front steps of the University of Michigan Union at 2 a.m. on October 14, public support, especially among young people, was soon widespread, and became impressive even to hard-nosed politicians. Wofford was soon one of newly-appointed Director Sargent Shriver's close colleagues in establishing the Peace Corps administration. Sixteen months after I received a most welcome February 18 '61 come-to-Washington-Monday telegram from Shriver I left my political science graduate studies at Harvard to be Peace Corps' first Community Relations Director. In that role I proposed and organized Peace Corps recruiting & support groups ("Peace Corps Service Organizations") in 25 U.S. cities, and provided Peace Corps staff and volunteer speakers with periodic compilations of talking points and overseas Volunteers' human interest stories. But Washington, D.C. lacked the appeal of serving in the third world. After I read in the new regulations that Peace Corps "Volunteer Leaders" (unlike Volunteers) could take dependents with them, my family and I signed up for two years in West Cameroon, south of Nigeria. Based near Bamenda, 200 miles in from the coast, I proposed and organized a 1300-member crafts marketing cooperative which soon doubled the monthly income of many of its woodcarver, pottery and basket-maker members. 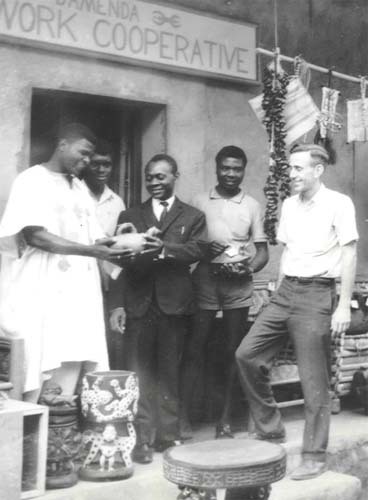 The "Cameroon Handwork Cooperative" at first had its sales shop in a two-room mud-brick house I rented for $5 a month. A month later we moved it to a $10 per month four-room house, and started trying to export; the first order from the UN Gift Shop was a major thrill. At last report the Cameroon Handwork Cooperative is still going strong, in larger quarters, nearly 40 years later. Back in New York after the two Cameroon years, one day I noticed a gift counter in Lincoln Center's Philharmonic Hall. Crafts and other items relating to the performing arts were being displayed and sold. I asked the clerk to hand me a pair of basketry-covered musical shakers -- which make a tchh-tchh-tchh sound to accompany African drumming. They still bore a Cameroon Handwork Co-op label with the member's name in my handwriting. The maker of the shakers had been a beggar in a remote village prior to formation of the co-op. But to each monthly meeting in his village he was now bringing a big burlap sackful of his shakers, and receiving payment at a rate twice what any of them could be sold for in his own area. I mailed him a Philharmonic Hall photo postcard -- perhaps the first mail he would ever have received. A schoolboy would read it to him: "Your shakers are being sold in THIS BUILDING in New York City. . . ."
That elderly villager now had a regular source of income beyond his dreams. . . and nine successive American Presidents, Democrats and Republicans, have proudly supported the Peace Corps idea. Sometimes a good idea works out. 1. Mary Corsi had already helped me produce a 22-page pamphlet entitled "Bread, Butter, & Brotherhood: Job Opportunities for College Graduates in the Trade Union and Cooperative Movements." 2. The article was written for an anthology on student leadership after World War II, to be published later this year by the American Council on Education; Eugene G. Schwartz, Malden-on-Hudson, N.Y., is the editor. You two! I'm exceedingly impressed with your contribution to mankind and was totally unaware of your work until now. The article reads smoothly and clearly; well-defined. Both of you have kept your light hidden under a bushel far too long. I'm prouder yet to call myself your friend and applaud you for talents, your ambition and your stamina as well as your outstanding contribution. Our country needs more people like you two. Here here! I believe that both Doug and Mary is an inspiration to us all. Knowning Doug is as close as I ever come volunteering for the PC but I did visit a few weeks in a poor country to see my friends there. Any ways, I feel that in my own way with my new chosen profession, I hope to emmulate his ideals. As a recent friend of the Kelley's, I have been so impressed with the commitment to this worthy cause. Doug started something that has had lasting effect on our young people and the world. I am so proud to tell his story to my friends. I don't think we have seen each other for about 40 years but you may recall I was an IDPA placee to Molusi College, Nigeria, in 1953. It is good to see an accurate accounting of probably the major stream that led into the Peace Corps. Iam a student @ howard cummunity college, majoring in nusring. I would like to get some information about working as a nurse in third world countries. if there is anyone to give such information I will be greatful. I have few question that need some answers. thanks . While you are researching the origins of the Peace Corps, I suggest you take a look at President Truman's Point 4 Program, and the contributions of Henry G. Bennett ex-president of Oklahoma A&M College. I never cease to be amazed by your unending energy, insight and commitment to social responsibility. You are truly a model citizen for all generations!